Exciting times on the blog as today myself and my good friend and fellow-Bedford-blogger Sarah from Sarah Kate Makes launch our first ever Linky! We'd love for fellow bloggers to join in with our monthly link-up...our aim is to create a list of lovely blog posts that describe the #WonderfulWeekends you all have. As champions of positivity and mindfulness, Sarah and I want to inject some extra-joy into our corners of the inter webs and it would be amazing if you could all spread-the-weekend-love too. All you have to do is add a link to any posts you write this month about wonderful weekend activities - it might be a family day out, a delicious meal, a mums/dads 'day off', or might just be a lazy weekend in your pjs - as long as it is wonderful to you then it is wonderful to us too! It could be an image collage post of pictures from your weekend, or a full on written post, it could be a review of family day out - anything goes, whatever works for you! 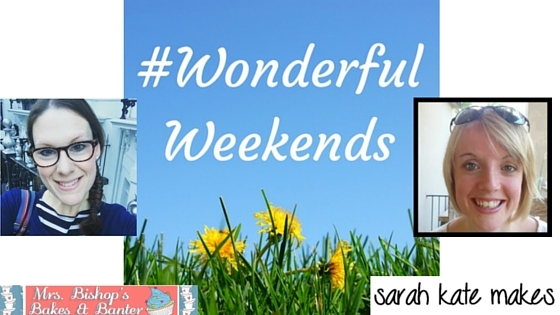 Remember to add the #WonderfulWeekends blog badge to your post, and to use the hashtag on social media. If you have time we'd really appreciate it if you have a peek at some other posts in the linky too and comment with the #WonderfulWeekends hashtag.